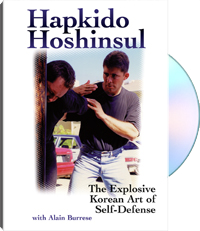 Hapkido is a traditional Korean martial art that translates as "The Way of Coordinated Power". Unlike the more popular and sport-oriented taekwon do, hapkido is a pure fighting art that combines powerful striking and kicking methods with devastating joint locks, throws and breaks. Alain Burrese received his education in this art at one of the premier hapkido schools in South Korea. He also tested its effectiveness as a bouncer in the toughest GI bars in Asia. Now, in this explosive new Paladin video, Burrese reveals the secrets of hapkido's amazingly effective techniques and shows you how to use its fundamental wrist, elbow and shoulder locks to defend against a variety of street attacks. Drawing from his own real-world experience, he also shows you how to adapt these techniques to the needs of the bouncer, security specialist or law enforcement officer.